The holiday season has extra magic in Puerto Vallarta and our family loves mixing our own family traditions with the traditions of Mexico in December. Getting the house looking festive for the season is part of that and, of course, a Christmas tree is always the center of any holiday decorating. But we have learned that when it comes to Christmas trees in Puerto Vallarta, the early elf gets the candy cane. Christmas trees are a hot commodity in Puerto Vallarta and the rule of thumb of when to purchase one is always “as soon as possible”. Generally, you will only find cut Christmas trees in the first two weeks of December before they sell out, leaving a few Charlie Brown trees for those who delayed. Costco is always a sure-fire bet for finding beautiful trees in two sizes: large and very large. If you have a spacious home or villa, this is the perfect place to find that spectacular, bushy tree that will fill your home with that wonderful holiday scent. If you have a smaller home that can’t accommodate something quite as grand, you can find other lovely options at local grocery stores or at Home Depot. 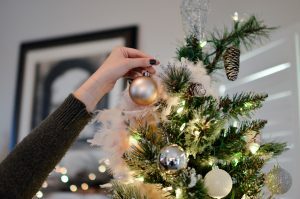 Remember, because you are buying early, you need to take extra care with your tree to prevent browning or needles from dropping, so avoid direct sunlight and keep your tree well-hydrated. Another option is to purchase an artificial tree that you can use year after year. We have always found a good selection at Liverpool, Costco and Home Depot, including pre-lit trees for easy set-up. Whether a cut tree or artificial, remember to deck your Puerto Vallarta halls early and get into the wonderful Christmas season that is so much a part of our local culture.